Azimuth Airlines, a new Russian carrier, took delivery of its first Sukhoi Superjet 100 (SSJ100) regional jetliner in an official ceremony on the first day of MAKS. The aircraft will enter revenue service with the operator in August. 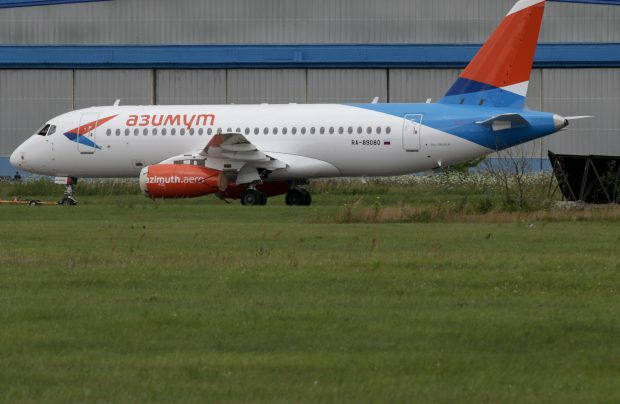 It will initially be performing charter flights, to be switched to scheduled operations from September, Azimuth General Director Pavel Yekzhanov told Russian Aviation Insider. The airliner will be based at Rostov airport, and will also operate from Krasnodar. Azimuth Airlines ordered four Superjets from State Transport Leasing Corporation (GTLK) in March this year. “We have a firm contract for four airliners,” Yekzhanov commented. “By April next year we will have received all of them, that has also been confirmed. The aircraft will be delivered to us as soon as they are built.” He also mentioned that all four aircraft represent the long-range (LR) modification. Asked how the airline plans to organize maintenance and continued airworthiness of its SSJ100 fleet, Yekzhanov pointed out that Azimuth has an in-house maintenance station: “We have hired 45 engineers and technicians, so the station is fully manned. Starting in December, we will be servicing our aircraft in-house. Our maintenance base will be located at Rostov’s new Platov airport.” He added that the facility is expected to receive all the requisite approvals shortly. Two of the four SSJ100s will be factory-new, with the remaining two previously operated by another Russian carrier, Yamal Airlines. Azimuth intends to start operations from Rostov’s existing international airport, and will eventually move to Platov, which is currently under construction and should open by year-end. GTLK Managing Director Sergey Khramagin commented that the new airline is deliberately configured for SSJ100 operations. Its financial strategy is built around the Superjet’s operational economics and the lease terms of the GTLK program, which offers preferences to Russian regional operators.